WELCOME TO MY EBAY STORE. BE SURE TO CHECK OUT MY OTHER ITEMS.I DO DISCOUNT ON MY SHIPPING FEEL FREE TO ASK ANY QUESTIONS ALL MY CARDS ARE SHIPPED IN BUBBLE ENVELOPES AND MY LOT ARE SHIPPED IN COUNT BOXES SO THEY WILL GET TO YOU SAFE I SHIP 3 TIMES A WEEK SO YOU GET YOUR ITEMS FAST..SHIPPING ON SINGLE CARDS TO THE USA IS $2.50 PLUS .25 CENTS FOR EACH ADDITIONOL CARD LOTS WILL BE DISCOUNTED JUST ASK IT DEPENDS ON HOW MANY CARDS AND WERE THEY ARE GOING 2001 FLEER BOARD CERTIFIED GUY LAFLEUR SHIPPING TO US 3.00,CARD WILL BE MAILED FAST AND SAFE . THANKS AND GOOD LUCK!!!!! Card #15 Guy Lafleur Stick. Montreal Canadiens. So if you see any white spots on the refractor or shiny cards its from the scanner not on the cards. I will be glad to do it. The Pokerfacecards in the middle of the card ((IT IS NOT ON THE CARD)) is my water mark. WE WILL NOT DISAPPOINT YOU. 1-2 CARDS ONLY. 2001-02 Fleer (Greats of the Game) Retro "Retrospection" Insert # 5 Guy Lafleur! GUY LAFLEUR. 2001 FLEER. YOU WILL RECEIVE EXACT CARDS PICTURED. THIS CARD IS IN NRMT CONDITION. 2013-14 Fleer Showcase "Metal Universe" # MU-29 Guy Lafleur! GUY LAFLEUR "BOARD CERTIFIED". Guy Lafleur "Board Certified". featuring Montreal Canadiens star Guy Lafleur! Cool piece of the boards from Joe Louis Arena. 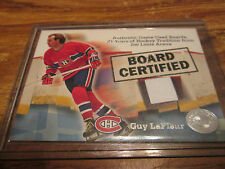 Board Certified Card #2 Guy LaFleur. Montreal Canadiens. HOCKEY CARDS. You are viewing the above-listed NHL Hockey Card as described in the title. This is a 2002-03 Fleer Legacy In The Corners Guy Lafleur Boards Card Montreal Canadiens. This is a 2002-03 Fleer Legacy Tailor Made Guy Lafleur Jersey Card Montreal Canadiens. Very little wear. Glossy with nice edges.